Are you interested in getting your child to study their math or improve their math skills? Maybe you have made some resolutions since it is a new year to improve your math skills. Well even though a lot of people make resolutions at the beginning of the year, a lot of those resolutions never make it past the first few days or weeks of the new year. With the new MathAlarm Application, you can fulfill a New Year's resolution and improve your math skills. This is something that you use every day or have your child use every day and at the same time use your current iPhone. More and more you'll find that people are using their phones to wake themselves up every day. 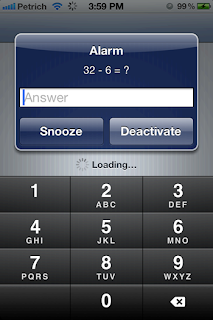 If you have an iPhone and you use the alarm, then you are ready thanks to the work of Ryan Petrich. He has developed an application known as the MarthAlarm Plus. It actually integrates math with the alarm clock found on the iPhones. It doesn't force you to use any new icons or create new settings. What it does is that it connects directly into the existing clock application and it changes the way the alarm clock works. When the alarm goes off, instead of you choosing the snooze alarm or the OK button to stop the alarm, the MathAlarm Plus application steps in and presents the user with a user interface alert view. 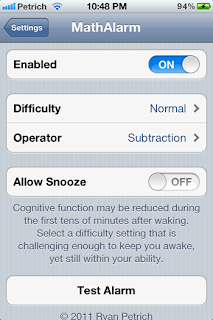 It will prompt you to answer a math problem before you can stop your favorite alarm sound. The questions will vary in difficulty and start your off by challenging your brain. The requirements to get this application is to pay $2.99 and get it through the Cydia store through the Big Boss repository. As always, you must have a jailbroken device to run it on. 0 Respones to "The MathAlarm Application"